^ "Top Business Programs 2010". Bloomberg Businessweek. Retrieved May 6, 2010. ^ a b c "2013–2014 Undergraduate Catalog" (PDF). University of Central Florida. 2013. Retrieved May 25, 2013. ^ "UCF SportsKnight 2008 Archive". University of Central Florida. Retrieved December 10, 2011. Amber Mariano (born October 18, 1995) is an American politician who sits in the Florida House of Representatives. A member of the Florida Republican Party, she was first elected to the Florida legislature in 2016 while still a student at the University of Central Florida. At 21, she was the youngest representative ever elected. She was reelected in 2018.She is the daughter of Jack Mariano, a Pasco County Commissioner. The Arboretum of the University of Central Florida is located on the main campus of the University of Central Florida in Orlando, Florida, United States. Covering 80 acres (320,000 m2), it contains more than 600 species of plants, including more than 100 bromeliads, in cultivated gardens. CFE Arena, officially the CFE Federal Credit Union Arena and formerly known as UCF Arena, is a sports and entertainment arena located in Orlando, Florida, United States on the main campus of the University of Central Florida. The facility recently underwent a name change and is now known as "Additions Arena." This name change came about following the name change of "CFE" to "Additions Financial." The arena was revived with new signage and part was painted black. It was constructed beginning in 2006 as a replacement for the original UCF arena, and as a part of Knights Plaza. The arena is home to the UCF Knights men's and women's basketball teams. The Arena also hosted the annual Science Olympiad in 2012 and 2014. The arena is 325,000 square feet (30,000 m2), and boasts a capacity of over 10,000, and 17 luxury suites. As of March 2017, the attendance record for the arena is 10,011, the arena's first ever sellout crowd, for a March 22, 2017 NIT Quarterfinals matchup with the Illinois Fighting Illini. The theater can be configured for concerts, family events, musical theatre, commencements, and other stage shows and sporting events. Local high schools often host graduations at the arena. One of UCF's biggest event, Knighthon, is also held at the arena. The fundraiser is a dance marathon which raises money for Children's Miracle Network. The CFE Arena is owned by the university, and is managed by Global Spectrum, a subsidiary of Philadelphia-based Comcast Spectacor. Christopher John "Chris" Latvala (born December 29, 1981) is a Republican politician who is currently serving as a member of the Florida House of Representatives, he represents the 67th District, including Clearwater and Largo in northern Pinellas County, since 2014. Lake Nona Medical City is a 650-acre (260 ha) health and life sciences park in Orlando, Florida, United States. It is located near Orlando International Airport and within the master-planned community of Lake Nona. The city is home to the University of Central Florida's Health Sciences Campus, which includes the university's College of Medicine and Burnett School of Biomedical Sciences. In the future, the campus will also house UCF's University of Central Florida College of Nursing, the University of Central Florida College of Dental Medicine, and a teaching hospital.The medical city also includes the Sanford-Burnham Medical Research Institute, Nemours Children’s Hospital, a University of Florida Academic and Research Center, and Valencia College at Lake Nona. In addition, the Orlando Veterans Administration Medical Center, began seeing clinical patients from February 2015. Lauren Brooke Frucci (née Thompson; born July 29, 1982) is an American television personality, print model and voiceover actor who works for Golf Channel, mostly as a co-host on "Morning Drive", the channel's daily morning show. She has been a host of "Top Ten", "Golf Now" (formerly "Destination Golf"), and the "College Sports Minute". She is also known for having worked for Total Nonstop Action Wrestling (TNA) as a backstage interviewer. This List of Presidents of the University of Central Florida includes all who have served as university presidents of the University of Central Florida since its founding in 1963. 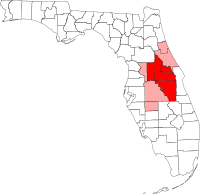 The University of Central Florida is a space-grant university located on a 1,415-acre (5.73 km2) campus in Orlando, Florida. UCF is a member institution of the State University System of Florida and is the second-largest university in the United States. Although the institution was founded in 1963, the name officially changed to the University of Central Florida in 1978 from Florida Technological University.The first president of the university was Dr. Charles Millican, who was appointed by the Board of Regents to create a new university in Central Florida. Realizing his goal when the first classes were held at FTU in the Fall of 1968, Millican would be followed by Dr. Trevor Colbourn and Dr. Steven Altman. The fourth president was Dr. John C. Hitt, who served from March 1, 1992 to June 30, 2018, the longest tenure of a UCF president. The current president is Dale Whittaker. The Marching Knights (also known as The Pride of Central Florida) is the official marching band of The University of Central Florida in Orlando, Florida, USA. Founded in 1980, the 300+ member Marching Knights are the largest and most visible student organization at the University of Central Florida. They are known for their high energy performances and varied musical selections. The band performs at each home UCF football game and select away games, home sports games, as well as any bowl games and other special occasions. Members represent a wide range of colleges and courses of study, and the organization is rich in history and tradition. The Naval Air Warfare Center Training Systems Division (NAWCTSD) is an Echelon IV command of the United States Navy, reporting to the Commander, Naval Air Warfare Center - Aircraft Division (NAWCAD) at NAS Patuxent River, Maryland. NAWCTSD is located in Orlando, Florida in the Central Florida Research Park, adjacent to the University of Central Florida (UCF). The facility is a part of a larger military installation within the Central Florida Research Park known as Naval Support Activity Orlando (NSA Orlando).The Commanding Officer (CO) of NAWCTSD, an aeronautically designated U.S. Navy Captain, is also dual-hatted as the installation CO of NSA Orlando. This results in a dual-track command chain, answering to the Commander of NAWCAD as CO of NAWCTSD for Naval Air Systems Command (NAVAIR) issues, and to the Commander, Navy Installations Command (CNIC) as CO of NSA Orlando for installation-related issues. NAWCTSD is the principal U.S. Navy center for research, development, test and evaluation, acquisition, life cycle program management and product support of all aviation, surface and undersea training systems, devices and programs for the U.S. Navy and all aviation training systems for the U.S. Marine Corps. It also provides interservice coordination and training systems support for the U.S. Army, U.S. Air Force and U.S. Coast Guard. The Venue at UCF is a sports and entertainment arena located in Orlando, Florida on the main campus of The University of Central Florida. The arena which was opened in 1991, housed the Knights men's and women's basketball teams from 1991 to 2007, and has served as home to UCF's volleyball team since 1991. The Venue also serves as a practice facility for the university's basketball teams, and houses administrative offices for the same.The Venue is 87,000 square feet (8,100 m2), and boosts 2,500 fixed seats, or up to 3,000 standing-room general admission. The Venue can be configured for concerts, family events, musical theatre, commencements, and other stage shows and sporting events. The Venue is owned by the university, and is managed by Global Spectrum, a subsidiary of Philadelphia-based Comcast Spectacor. The UCF Knights are the athletic teams that represent the University of Central Florida in Orlando, Florida. The Knights participate in the National Collegiate Athletic Association's (NCAA) Division I (FBS for football) as a member of the American Athletic Conference.UCF, its athletic program, and the university's alumni and sports fans are sometimes jointly referred to as the "UCF Nation," and are represented by the mascot Knightro. The "Knight" was chosen as the university mascot in 1970 by student election. The "Knights of Pegasus" – as it was originally called – was a submission put forth by students, staff, and faculty, who wished to replace UCF's original mascot, the Citronaut, which was a mix between an orange and an astronaut. The Knights were also chosen over "Vincent the Vulture," which was a popular unofficial mascot among students at the time. In 1994, Knightro debuted as the Knights' official athletic mascot.The Knights field 16 varsity teams (6 men's, 9 women's and one co-ed sport) that have won numerous national and conference titles. The Knights football team won five conference championships and one self-proclaimed national title in 2017. The Knights women's basketball team won conference titles the 2009 and 2010. The UCF cheerleading team has captured two national titles at the College Cheerleading and Dance Team Nationals, in 2003 and 2007. Athletics facilities on the campus include the 44,206–seat Spectrum Stadium, the 10,072–seat CFE Arena, 3,000–seat Venue, John Euliano Park, the UCF Soccer and Track Stadium, and the UCF Softball Complex. The University of Central Florida College of Arts and Humanities is an academic college of the University of Central Florida located in Orlando, Florida, United States. The dean of the college is José Fernández, Ph.D.The College of Arts and Humanities was established in October 2005 after the College of Arts and Sciences was split into the College of Arts and Humanities and the College of Sciences. When Fernández was named dean of the new college in 2006, he became UCF's first Hispanic dean. The residence hall system at the University of Central Florida in Orlando, Florida is administered by the Department of Housing and Residence Life. 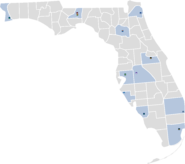 As of 2011, the system offers just under 6,500 beds on its main campus within five housing communities, 400 beds at the Rosen College of Hospitality Management, and 3,750 beds in university-affiliated housing.Housing on the main campus is separated into five communities, the oldest being Apollo, and the newest dorms being the Neptune Community in the Academic Village. The majority of on-campus housing is occupied by freshmen, while the bulk of upper-class and graduate students live in off-campus apartments, houses, and cooperatives. The United Resident Student Association (URSA) is the residence hall association for the university. All residents living in on-campus housing, UCF Affiliated Housing, or the Rosen College of Hospitality Management Housing are automatically members of URSA. WUCF-FM (89.9 MHz) is a listener-supported radio station of the University of Central Florida in Orlando, Florida, United States. The station is one of Central Florida's two NPR member stations, along with WMFE-FM.WUCF-FM is co-owned and operated by the University of Central Florida.